Infinity Con, located in Lake City, Florida, turned out to be a surprisingly impressive small sci-fi convention. This was the first time I’ve attended Infinity Con and only the second time the event has been open. Sci-fi conventions are usually spread out over a weekend but this one was only on Saturday, July 18th. My initial reaction to the convention when I arrived was, “Wow. This is small.” My typical convention route includes big names like MegaCon and Star Wars Celebration, which are both flooded with over 30,000 people on average. Infinity Con was located in a temporary tent, which was covered and air-conditioned for comfort. There was a small exhibit hall with local vendors, an artist room, and a panel room. I would say that only a few hundred people were in attendance. The biggest draw for Star Wars fans was Roxy the Rancor, a 700-pound, 17-foot long replica of the rancor we see in Return of the Jedi. Roxy was free for guests to take photos with but donations to UNICEF were encouraged. Most of the vendors were selling Star Wars merchandise. This included action figures from the Power of the Force line as well as some of the more recent action figures, like the Black Series and Rebels line. One booth even had the 2015 San Diego Comic Con exclusive Funko POP bobble heads. I noted that all of the Star Wars booths had very reasonable prices and most of the vendors were willing to negotiate on price if you bought multiple items. The artist alley also had a large Star Wars presence. Over half of the artists had sketches, paintings, and digital art featuring characters from every Star Wars movie, even The Force Awakens. The convention hosted a silent auction called “Art Wars” that displayed only Star Wars artwork and allowed attendees to bid on their favorite pieces. The proceeds from the auction benefitted a not-for-profit corporation called the Hero Initiative. The 501st Legion and Rebel Legion had a booth with various helmets and completed costumes on display. Trading cards and temporary tattoos were given out for free to people who checked out the booth. About 10 members of the 501st and Rebel Legion were walking around in costume. Captain Rex, the new First Order Stormtrooper, and a Rebel Pilot were popular with guests. The Jedi Academy of North Florida were also in attendance and showed off some of their lightsaber dueling skills during the day. I would definitely encourage Star Wars fans from North Florida to check out this event next year if it is hosted again. 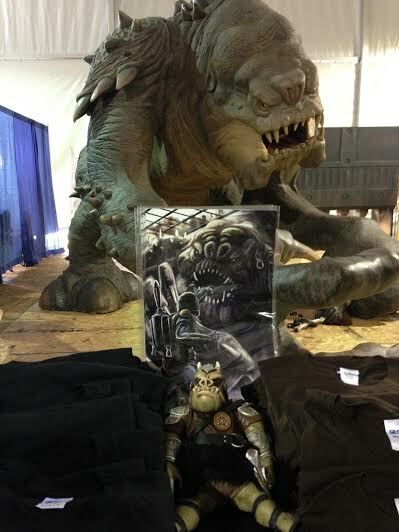 If you’re interested in buying hard to find Star Wars merchandise, take pictures with 501st members, and see Roxy the Rancor in person, then Infinity Con is definitely for you.